Off-plan property transaction now make up almost half of all residential sales in Dubai, with buyers taking advantage of increasingly generous payment plans, according to listings portal propertyfinder.ae. The company said cheaper homes and lower deposit requirements were driving investors towards off-plan deals. It said median prices for homes have fallen by 20 per cent between November 2015 to April 2017, extending a slump that had begun two years earlier. Yet lower prices have not affected developers’ sales of off-plan homes, with Emaar Properties and Damac Properties reporting higher sales in the first quarter of 2017. Emaar booked deals worth Dh6.05 billion in the first quarter, a 44 per cent year-on-year increase, while Damac sold properties worth Dh2.2bn, up 11 per cent year-on-year. Propertyfinder Group’s chief commercial officer, Lukman Hajje, said buyers of completed projects typically have to find a deposit of 25 per cent of a home’s value, plus a further 6 per cent to cover charges and fees. Emaar Properties has some of the least generous payment schedules, Propertyfinder said. For instance, at Downtown Views II it requires 70 per cent of a property’s value to be paid during construction and the remaining 30 per cent on completion. 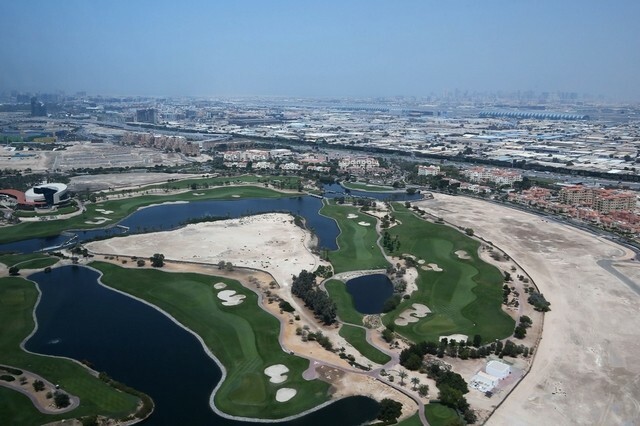 Damac Properties, by comparison, allows for 60 per cent of the payment for its Casablanca Villas scheme at Akoya Oxygen to be paid on completion, and Dubai Properties offers similar terms at Mudon Views. Smaller developers are even more generous, it said, with Danube Properties requiring 25 per cent of a property’s value at its Bayz project to be paid within 120 days, and the remainder to be paid at 1 per cent per month until December 2023. “In theory, buying off-plan allows investors to take advantage of historically low Dubai property prices for a very low cost and a get a foothold in the market but this strategy does not come without risk,” Mr Hajje said. The property broker Core Savills said in its Q1 Dubai residential report that off-plan sales were enjoying a “robust performance”, especially in established areas like Dubai Marina and Downtown Dubai. “Off-plan sales are increasingly regaining a foothold, particularly products from reputed developers – although having a detrimental effect on secondary market sales, notably in prime apartment districts,” said David Godchaux, the chief executive of Core Savills.